The Page 69 Test: "Surveillance"
Reece Hirsch is the author of four thrillers that draw upon his background as a privacy and cybersecurity attorney. The Insider was a finalist for a Thriller Award for Best First Novel. His next three books, The Adversary, Intrusion and Surveillance, all feature former cybercrimes prosecutor Chris Bruen. Hirsch is a partner in the San Francisco office of an international law firm and co-chair of the firm’s Privacy and Cybersecurity practice. 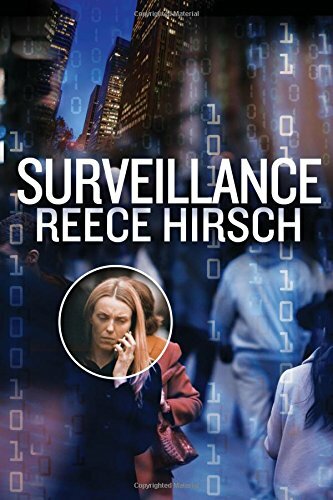 In Surveillance, Chris Bruen and ex-hacker Zoey Doucet discover the existence of a clandestine government agency that is carrying on the domestic surveillance that has become more difficult for the NSA in the wake of the Edward Snowden revelations. That knowledge puts Chris, Zoey and their new client “ethical hacker” Ian Ayres in danger, sending them on the run from California to Ecuador to Mexico. But how do you escape an adversary who has access to every email, every phone call, every video feed? Five years ago Sam had led the rundown of Sheila Capaldi, an NSA office manager who had been turned by Russia’s SVR. Sheila had been a slightly pudgy, jovial woman who liked to talk about Survivor and her fixation with the actor Colin Firth. She baked cookies for the office every other Friday. Sam could tell that her friendly demeanor was not an act. He had worked among spooks long enough to believe that he could spot them. Even when they were wearing the mask of an ordinary person, there was usually a bit of the performer to them, a quick, self-congratulatory shift of the eyes that revealed how much they enjoyed the game. It wasn’t much, but Sam had come to know it when he saw it. And he had learned that lesson the hard way. A week after Sam located Sheila, which had been all too easy, he ran an Internet search from his home computer to see if he could find out what had happened to her. He found an obituary that said she’d committed suicide. Sam knew that he wasn’t supposed to take his work home and that the NSA was probably monitoring the Internet searches of its data analysts, but his curiosity had grown overpowering. After learning of Sheila’s death, Sam had become much more disciplined about keeping his curiosity in check. Knowing the outcome didn’t help him do his job. This passage is written from the point of view of Sam Reston, a lifer NSA data analyst who has been read into a new off-the-books operation know as The Working Group, which is carrying on the domestic bulk metadata collection that the NSA conducted until the passage of the USA Freedom Act. When Edward Snowden first anonymously contacted Glenn Greenwald and the journalist was beginning to get a sense of the magnitude of the story, he imagined that the whistleblower was some middle-aged, disenchanted lifetime NSA analyst. The baby-faced Snowden defied Greenwald’s expectations. Sam Reston is the type of character that Greenwald expected to meet in that hotel in Hong Kong. In Surveillance, I wanted to explore our current surveillance state from three perspectives: someone on the run from an all-seeing government agency (Chris Bruen), someone attempting to hide off-the-grid (Zoey Doucet), and someone who was part of the machinery of surveillance -- the increasingly conflicted data analyst Sam Reston. The Page 69 Test: The Insider.